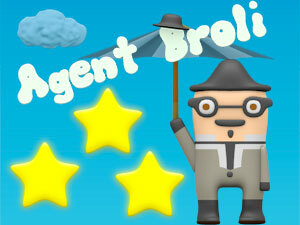 Home / Online games / Games Arcades / Game "Agent Broli"
Help the agent Broli to execute all important missions and to collect all stars in this active free online game. Play more accurately, on the way the set of obstacles will meet, and health of the agent is limited. But in this free online game you will be helped by pleasant bonuses which will meet on your way - play safely and collect them! Play free online, complete the game and get more than all score and become the champion! Let your name flaunt in the list of winners! The brave penguin protects his house from attacks... Play online now and help him! Drive your Truck and jump on hills! Continue of adventures of sly cats. You likes to misbehave?! :) Then this free online game - is that you really need! New adventures of sly cats again. Fly to the sky, play online together with beautiful fairies and collect stars! Drive on a steam locomotive on the road with obstacles! This online a game is very interesting! Catch all mouses with sly cats.